Literary parks are a peculiar Italian institution. While some places capitalize on writer sites for tourism (like Sherlock Holme’s fictitious home in London or Mark Twain’s in Hartford), Italy has created a series of parks that honor its literary tradition, and many of these abound in Sicily. 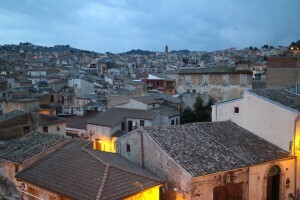 Racalmuto, a small town further inland, is home to the important writer Leonardo Sciascia. Signs indicate places important to Sciascia, and his statue can be found in the town center (a man who works at a nearby museum assured us that the statue’s small stature is that of Sciascia: he used to see the writer walking around town but informed us that he was much, much fatter than the statue). We passed by the Circoli, a sort of social club meets workers union, and his home. We walked the streets of the town that inspired Regalpetra. What was striking to me was the complete absence of tourists. An Italian man walked by with his son and said, “Look. Tourists.” They half-walked away and half-stared at us, a spectacle in their small town. Though this is anecdotal and might just be special to the day that we visited, what I gathered is that people aren’t interested in visiting Sicily for its rich literary tradition. Instead, there’s a distinct tourist route of ruins, temples, a couple big cities, beaches, and baroque cities.